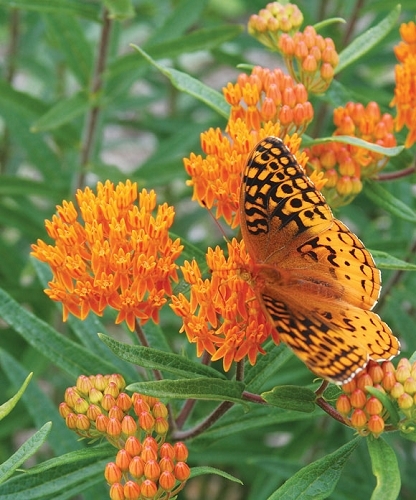 Butterfly weed is a very striking native perennial and one of our most popular plants. It is difficult to transplant from the wild--especially when people dig it up while in full bloom. 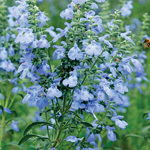 However, our nursery stock ( that we grow from seed) is easy to establish in your yard or flowerbed. Milkweeds are host plants for the monarch butterfly, and butterfly weed seems to be the poster child for attracting monarchs to the landscape. While monarch caterpillars will devour the foliage, deer tend to avoid it because it is bitter and nasty. It was important medicinally to native Americans and has been used to treat bronchitis, pleurisy, and other lung ailments. Beautiful orange flowers, will reseed if it likes its location. Full Sun, minimal watering, very hardy! 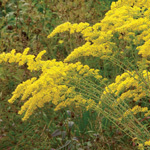 This might just be the perfect native plant. Started from seed in June and it bloomed a few flowers that year. The second year it was loaded with blooms from mid-May through the start of September. Had the Monarch caterpillars not eaten all the buds it would have been blooming profusely through mid-September. The flowers may be the best feature of the plant. Not only is it hard to find orange blooms in a native plant but even better once the flower is dead it is still bright orange and quickly falls off the plant on it's own so you don't have a bunch of dead, brown blooms to look at or cut off. It was so top heavy with blooms that after a couple of back to back thunderstorms it laid over but it quickly filled in the hole and had you not known it, you would have never been able to tell. Also interesting to watch the process from the butterfly laying eggs to the butterfly hatching. From 5 plants I counted at least 16 Monarch caterpillars at one time and the plants still looked good. I also gathered half a peanut butter jar of seeds to plant a larger patch this year. This plant will not disappoint! Q: Can Butterfly Weed be planted in the Fall? I live in Southern Missouri. We sometimes get below freezing temperatures. 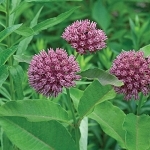 I also want to plant Marsh Milkweed this fall. A: Sure, you can plant them in the fall. Butterfly weed still needs to be planted in well-drained soil--sitting in sopping wet conditions can sometimes cause the roots to rot. Marsh milkweed is less particular. A fall planting will give the plants a head start next spring. Q: Are these plants actually grown already? Or are they something that I should plant from a seed? I am wanting something that is going to bloom quickly and will be bloomed still around the 24th of October. I am also interested in the Rose Verbena. A: The milkweed plants have been grown from seed since this spring. They are less than a year old and will not bloom this year (Oct. 16, 2015). The rose verbena blooms periodically throughout the year. Ours may bloom a little between now and November, but they aren't fully grown plants yet and won't produce lots of flowers until next year. Q: How many seeds do you typically include in an Asclepias tuberosa packet? (More generally, it would be helpful to have an approximate seed count per packet on each product page. Just a suggestion!) Also, can/should these seeds be direct sown outdoors in autumn? Thank you! A: Nearly all of the packets we sell will have at least 200 seeds in them, regardless of species. Butterfly weed will have at least 200. (We'll work on adding that info on the product pages.) A lot of milkweeds will germinate without a cold moist period that they normally get over winter, but will germinate more vigorously if they have 3 to 6 weeks or more of exposure to winter conditions. So yes, you should sow them sometime between November and January. Q: I'm anxious to get these started ASAP, and not wait till late fall. Will they germinate if planted in May or June? What if I put the seed packet in the refrigerator or freezer for a while? How long would you suggest? Thanks a lot! A: Our current seed lot from Iowa has about a 90% germination rate. These seeds should not need any special treatment in order to germinate right away. You can sow them now.